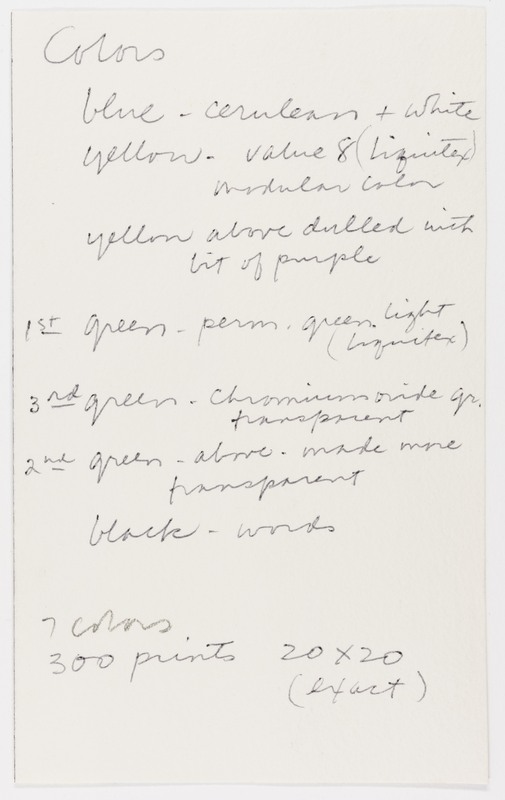 Inscriptions: c. handwritten in ink: "Colors / blue - cerulean + white / yellow - value 8 (liquitex) modular color / yellow above dulled with bit of purple / 1st green - perm. green light (liquitex) / 3rd green - chromium oxide gr. transparent / 2nd green above - made more transparent / black - words"; l.l. handwritten in pencil: "7 colors"; l.c. handwritten in ink: "300 prints 20 X 20 (exact)"
"Untitled." Corita Kent in the Grunwald Center Collection. Los Angeles: Hammer Museum, 2017. https://​hammer.ucla.edu/​collections/​grunwald-center-collection/​corita-kent/​art/​untitled-preparatory-material-for-the-common-dandelion-f/​.